That unassuming little pdf managed to find 220 winners from 969 runners that season. It found no less than 497 1-2-3 finishers, and made a profit of £1,207 to £20 level stakes at Betfair SP by season end. A 22.7% win rate and 51.29% top three rate was surely unsustainable, no? Well, in fact, TTS continued to perform to that high level year after year. Indeed, the following season, it surpassed that first year, recording a profit of £1,936, again to £20 level stakes. 2008/9 was to be my last year with the product, and that jumps season notched profits of £1,141 to the same level stakes. Three years of TTS had yielded a collective profit of £4,284 to just £20 stakes. And this wasn't fantasy back-fitted numbers. No, these were real subscribers making genuine year-after-year profits. Due to a change in my own circumstance, I handed over the reins to TrainerTrackStats in 2009 (seems such a long time ago now!) to Gavin Priestley, who also took over my old blog at Nag-Nag-Nag. He's done a sterling job of maintaining both sites in the original style, but also has extended them with his own ideas and knowledge. So would a change of stewardship mean a change of fortunes for TTS followers? Of course not! After a slow first year, though still profitable, TTS kicked back into overdrive recording its best ever season in 2011/12. That year, backing selections for £20 at Betfair SP was worth a tasty £2,174. And the two years since then, bringing us to now, saw profits of £681 and £1,281 respectively. That's eight years of TTS - in itself some sort of achievement in a market place awash with fly-by-nights and Johnny Come Lately's - and eight years of profit. There have been some great stories down the years, best of which has to be a guy called Chris who won fifty grand for a twenty-two quid bet by doing a £2 yankee on four TTS selections. But the main story has always been the year-on-year profit-pulling performance of TTS. TrainerTrackStats is, as the name suggests, a list of the trainers who have been the most profitable to follow at each National Hunt track in the UK in the previous seasons. For each track, there is a selection of trainers, and the specific rules under which they are a bet. It's easy enough to find selections using any daily newspaper or, of course, geegeez racecards online! Or, if you're time pushed, you can get the picks each day from a password-protected members' area. Log in, get picks, place bets, job done. TTS works because it taps into the tried and trusted habits of race horse trainers, some of which are probably buried deep in their subconscious! Like all humans, trainers are creatures of habit. If something has worked for them in the past, they will persist with it in the future. 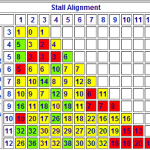 TTS sniffs out those patterns and habits, and puts a profitable wrapper around them. TTS has made a profit every year since its inception in 2006. That in itself sets it apart from almost any tipping service, including revered so-called 'guru' services like Racing Post's Pricewise column (that doesn't even publish its profit and loss... for a reason! Not only that, but TTS results are quoted at Betfair SP, which means those betting early prices Best Odds Guaranteed can often do a good bit better than the quoted results. And it also means that the odds were available to EVERYONE who wanted them, again unlike certain 'Pricewise' type services. 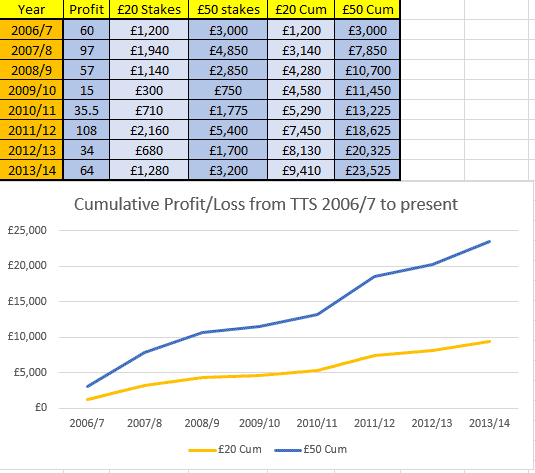 Here's a chart that shows the cumulative profitability to £20 and £50 stakes. If you bet in fifty's, great, that's almost £25,000 over the last few years. But, for those of us who tend to bet in shorter stacks, TTS has still recorded profit of over £9,400 since inception and is on course to smash through the £10k barrier this season. That's a spectacularly consistent level of performance. What do I get with TTS, and how much is it? There is also a comprehensive 'how to' manual and, as mentioned, a members' area from where you can pick up the day's selections each day (or the night before). The historical profit average, over eight years, is 58.8 points per season. At £20 stakes, that's £1,176.25. Remember, these aren't back-fitted profit figures. These are the actual profit levels achieved by TTS subscribers over the past eight seasons. So, given that your season ticket for TTS 2014/15 is just £79 - nothing else to pay - that represents an average annual profit after TTS investment of as close to £1,100 as doesn't matter... betting at £20 stakes. Can you guarantee I'll make a profit with TTS? 1. An unrivalled eight year unbroken track record of success. It's possible that this year will be the first time when a profit is not returned, but why should it be? After all, the same painstaking attention to detail has gone into producing this year's report as has been poured into every other year. And the figures actually look more promising than ever. 2. An unconditional 30 day money back guarantee. If TTS doesn't work for you, or you simply don't like the font it's been printed in, Gavin will refund every penny of your investment. Now, please, we've built a solid and honest community here at Geegeez, and I'm delighted at how respectful readers are to each other in the comments and emails I receive. So I would make one personal plea: if you're not the type to give something a proper go, perhaps paper trading in the refund window, then please don't sign up for this. If you can't cope with three days without a winner, then please don't sign up for this. It probably won't suit your style, and you'll be wasting both your own, and Gavin's, time. But if you get that TTS is a season-long project; and you know that it will have downswings as well as upswings along the way; then you're a really good fit for TTS, and TTS is a really good fit for you. It's a great, great product and service. Having originally devised it way back in 2006, I'm bound to say that of course. But its track record speaks for itself: eight years in print, eight years in profit. p.s. You can actually get started for as little as £29 - click here for more details. p.p.p.s. Did I mention I love this product?! I really, really love it. Go here now to see why. p.p.p.p.s. We'll also be doing a full Geegeez day-by-day review of TTS, which can be found right here. The guy that won £22k, was he the one that then went to Tesco and bought some tea-towels with his winnings?! 50k! That’s a lot of tea-towels…. Matt, what time do the selections go on line? It can be difficult to get on at work sometimes. Tomorrow’s (no qualifiers) statement is already online. There will generally be qualifiers, though it’s still very early days for the NH season, of course. Been a TTS follower for years, love the theory behind it. In fact I also joined his recent systems which are great fun, obviously I am a member here and love this place, the only other thing I subscribe to is the service provided by Ben Aitken, who posted above. Three brilliant services all offering great services at reasonable cost. Here’s the full tale of the tape from last year. That should help you find longest drawdowns and the like (I’m afraid I don’t have that specific information to hand). Hi! How can we know the results are real? At the end of the day, if you didn’t do something yourself, how can you know anything happened? Without getting too philosophical about it, and I do appreciate where your question is coming from, at some point you have to trust what you’re reading. If you don’t, or can’t, then you have to let the opportunity pass and move on. I can personally vouch for every single TTS result, as it is a service I originally created, and have followed very closely ever since, for what I hope are obvious reasons. On top of everything else, if you’re still not sure, there is a 30 day guarantee, which means you can try it and if you’re not happy, claim a refund should you need to. If you have read my comments above about giving things a fair try, and paper trading if necessary, then you’ll probably not want/need a refund. But the offer is there in case. There’s really not much else I can add, I’m afraid. I hope that helps at least a little bit. Hi Matt for the chap that asked about backing EW on TTS runners for 2013-14 you would have made a further £548 profit to £20(27pts) in 2012-13 a further £239.67(12pts) both those figures are to sp I only have those 2 years of data. Thanks a lot for the figures, Gary. Much obliged. I use a Apple I Pad,would I have problems downloading the manuals,accessing the site etc,etc? No, that should be absolutely fine. Could you please advise me on a betting bank. It’s not my place to do that these days, but when I founded TTS I always used to advise 100 points. That’s is the figure a had in mind. The answer is yes, and they’re usually there the night before racing. For example, tomorrow’s are online now (5pm). hi, is there a s/p or b/s/p cut off point for backing on tts BOB. Yes, 14/1, I believe. Best to check with the guys at http://www.trainertrackstats.com in case anything’s changed, but I think that’s correct. hi , today no selections yet in the members area nov;17 14.00 regards BOB. That’ll mean there are no selections to fit the exacting criteria.